I can’t argue with that kind of logic, so of course I gave it up. She totally cracks me up. She starts preschool next week Wednesday so I am trying to think about whether I should base the one bento I will make for her each week on a specific day (ie every Friday) or on days when I know she’ll have a hard time with what they serve. I guess we’ll see! Should I make her one on her first day to help her cope or just let her plunge head first into school? Yesterday we had Zippy’s frozen stuff for dinner, which never disappoints. For the first time I had their chicken curry and it was really good. 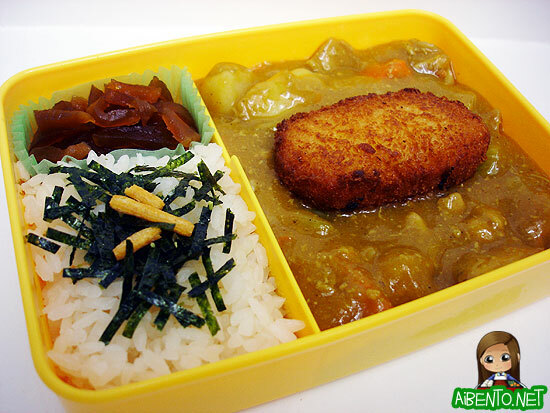 I’d had their hamburger curry once before so I guess I shouldn’t have been too surprised, but I hadn’t eaten it in like 8 years so I forgot what it tasted like. I took leftovers and was at a complete loss this morning on how to dress it up. When I first started it was just boring rice and curry. I ended up adding a cream corn croquette. This is actually the second one I fried. The first one I made the big mistake of sitting down at my comp instead of watching it and remembered the poor thing 2 threads later. But I ate the first one so it wasn’t a complete loss. After a while I thought it was still too boring so I scooped out some of the rice and added sliced sanbaizuke. It made sense because whenever we eat at Curry House (Coco Ichibanya) they include brown pickles anyway and of course this one tastes worlds better than the bitter stuff they serve there. Then I finished it off with some nori flakes and crackers from a ochazuke flavor packet. 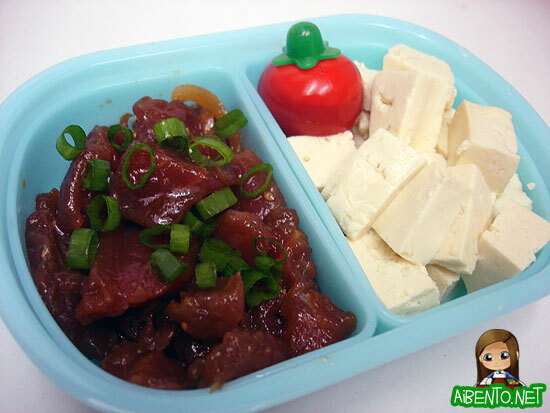 Instead of a KCCA salad today, I packed another bento with tofu cubes and ahi shoyu poke. To add color I put in a red tomato soy sauce bottle and some chopped green onions onto the poke. Although I’ve been cheating by eating cream cheese brownies I made Sunday, my high vegetable intake seems to be working slowly. I’m back down to 127.2 from hovering around 128.5 for the last week or so.